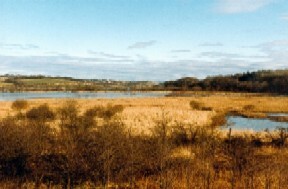 Lochwinnoch RSPB Nature Reserve, founded in the early 1970’s, is situated approximately 0 kilometres south west of Glasgow (NS 59 581). The reserve is part of Clyde Muirshiel Regional Park and is a SSSI. The reserve consists of two shallow lochs, Aird Meadow Loch and Barr Loch (both former flood meadow systems, redundant since approximately the 1950’s) which are fringed by marshland which is in turn fringed by carr woodland and drier deciduous woodland. There are also areas of scrub, and a mature beech wood. The visitor centre is situated 0.8 kilometres from Lochwinnoch village beside the A760 and is signposted from the A737. Lochwinnoch rail station (on the Largs/Ardrossan/Ayr to Glasgow line) is adjacent to the reserve, and several bus routes are within 15 minutes walking distance of the site. There is a visitor centre featuring a sizeable ground level viewing area, viewing tower and a well-stocked RSPB shop. From the visitor centre, two level trails lead to three hides which overlook the Aird Meadow loch. The visitor centre, trails and hides are accessible to wheelchair users. The visitor centre is open daily from 10am to 5pm, with the hides and trails open at all times. Disabled parking. Wheelchair access to Centre (1:15 ramp) and hides (1:40 ramps), paths surfaced in rolled stone, narrow in places (900mm), one section of boardwalk. Further info from www.rspb.org.uk. Just off National Route 7, Irvine to Glasgow. Over 100 species are recorded annually. Breeding species include over 150 pairs of Sedge Warblers , several pairs of Grasshopper Warbler and over 20 pairs of Reed Bunting . Other breeding species include Water Rail and Great Crested Grebe . Management work on the reserve has contributed to an increase in breeding waders, with Lapwing and Snipe being regular breeders, and Redshank and Curlew being occasional breeders. Species recorded on passage have included raptors such as Marsh Harrier and Osprey and waders such as Dunlin , Jack Snipe , Black-tailed Godwit, Green, Wood and Curlew Sandpiper, Greenshank and Whimbrel . White Wagtails have been recorded in autumn. Autumn and Winter brings up to 40 Whooper Swans and 00 Greylag Geese to the site, with Wigeon , Teal, Goldeneye and Goosander present. Smew and Scaup occurs in most winters and Long-tailed Duck are seen occasionally. Glaucous and Iceland Gulls are worth looking out for at the Barr Loch gull roost, and also at the adjacent Castle Semple Loch where a multitude of gulls are regularly to be found feeding on scraps of bread thrown by visitors! Also worth looking out for in winter are Bramblings – historically, Garthland Wood (which runs alongside the A760 near the Glasgow to Irvine cycletrack) was a “top spot” for this species. Hen Harrier and Merlin are occasionally noted over Aird Meadow. A number of rarities have been reported on the reserve including Purple Heron, Spoonbill, Black Duck, Yellow-browed Warbler and Red-backed Shrike . An Eye-browed Thrush was recorded in 1978 – the second Scottish record. A Reed Warbler in 2000 and a Nuthatch in 2001 were the first records for Renfrewshire and the Clyde Area, respectively. The Lochwinnoch Nature Reserve Management Plan is available for consultation at the visitor centre. Copies of the twice-yearly Lochwinnoch Nature Reserve newsletter Wilsonia are also available at the centre. Currently in production are a checklist of the birds of the reserve and the latest reserve bird report.